We strive to build teamwork, fellowship, and technical competence while having fun and displaying gracious professionalism. 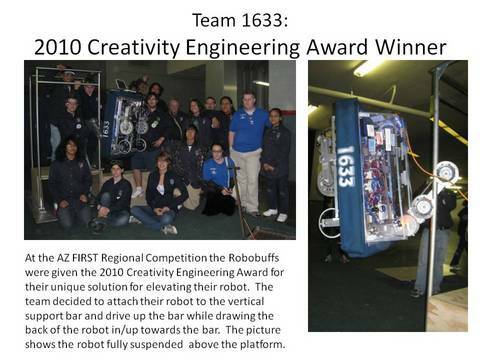 While keeping to a busy schedule of designing, building, and competing with robots is an integral component of the THS Robotics Team, so is Community engagement. Employing our mechanical buffalo mascot, Robi, we are commited to rallying the fans at Pep Rallies and home football games - along with our t-shirt launcher; supporting the THS Autism programs and Muscular Dystrophy with walks at the Phoenix Zoo and Tempe Town Lake; community outreach at the Tempe City Halloween Fair, Tempe Center for the Arts and Gilbert Senior Center; supporting STEM events like Tempe city's GEEK Night Out and Mesa's SciTech Festival; and supporting philanthropic efforts of the Support My Club organization.